SPAR Eastern Cape have joined hands with charity organisation Love Story in a twin initiative this week to spread some festive cheer to residents in Nelson Mandela Bay’s most impoverished areas. The SPAR Buckets of Blessings project, which started yesterday, will see 250 families receive a bucket filled to the brim with a variety of groceries this week. Each is designed to last for a month. SPAR EC are also ploughing resources into a Festive Feed programme, which will see them supply the ingredients for food for 18 soup kitchens Love Story have set up with community leaders in the city’s poorest townships. The family retailer’s promotions and advertising manager Wendy Westraadt said they had always planned to do something at the end of the year to support those “less fortunate than ourselves”. “We also wanted to make sure the Buckets of Blessings went to the people who needed it the most so we made contact with Love Story to see how we could get involved,” said Westraadt. She said Love Story, under founder Elaine Watson, already did “an amazing job” and they felt it would be beneficial to support their feeding campaign which runs throughout the year. “We thought we would tag on to that because it made sense. We are, after all, in the food business. Westraadt said they were grateful to the many suppliers who had supported the initiative in donating the products which would help to sustain a family for a month. 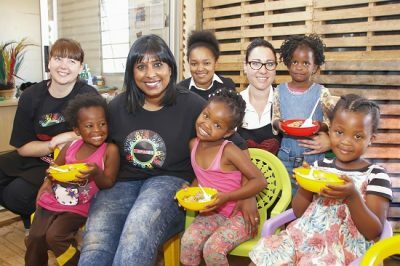 Watson said organising the feeding scheme was the biggest project run by Love Story, with 18 soup kitchen outlets having been set up in the townships. “There are thousands of hungry people in our region and we are able to support only a fraction of those,” she said. She said they were grateful for SPAR’s involvement as there were often less donations for their cause during December. “Everyone is under a bit of pressure at this time and we find the donations are few and far between,” said Watson. Watson said they sent out parcels to 250 families every week, all of whom are on their database through the soup kitchens. “We work with community leaders in terms of who are the poorest of the poor from that database and we deliver the Buckets of Blessings to those families.